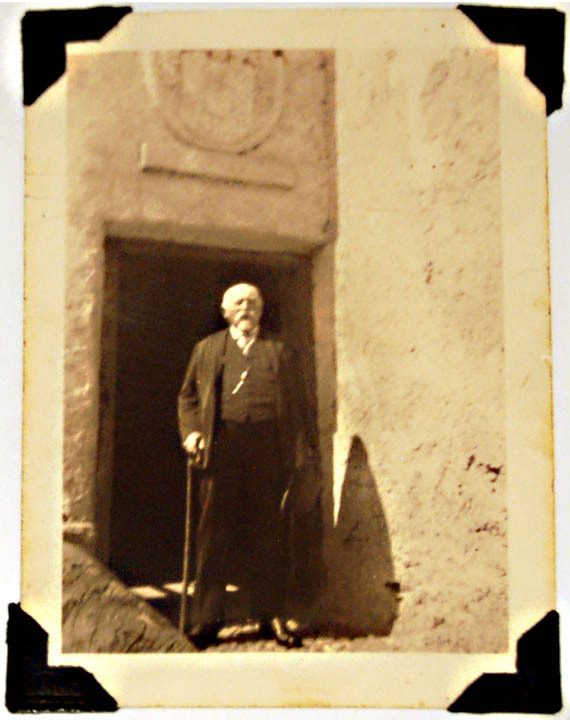 Last week I received a wonderful package of photos and information from Jean Branz Daly. Jean is my first cousin once removed (my father’s 1st cousin) and the granddaughter of Damiano and Oliva Genetti. We have been corresponding for several months and Jean has shared many of her family memories with me. Her package of photographs was a treasure trove! I’ve spent the last few days adding many of them to our Gallery section of the website. click here to view Family Photographs. Jean was also kind enough to make copies of a booklet from the Tirolesi Alpini from Hazleton, PA. 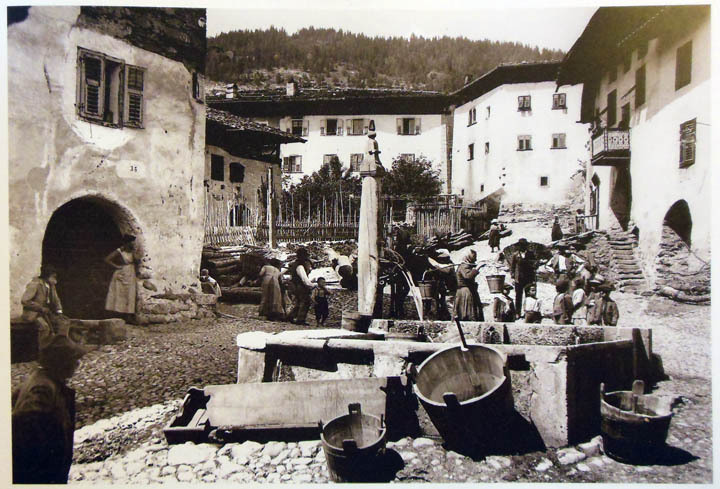 This social club was dedicated to those who had emigrated from Tirol (Tyrol). 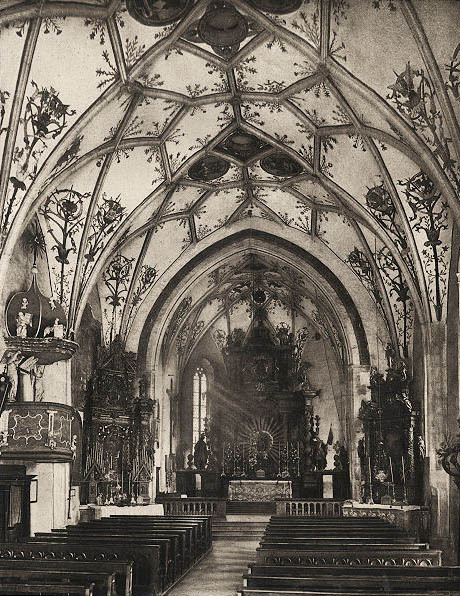 It contained a number of interesting articles and photos about the Tyroleans of Hazleton, including several about Genetti family members. I’ve added one about Gus Genetti Sr. to our Family Story page, click here to read. Thank you so much Jean! Our ancestry becomes richer with the memories we share! About two weeks ago I received an email from a woman searching for information about her family. Melissa explained that her maternal great-grandparents had emigrated from Tyrol and settled in the Hazleton/Nuremberg, Pennsylvania area. Her great-grandfather and grandfather had the surname of Genetti. 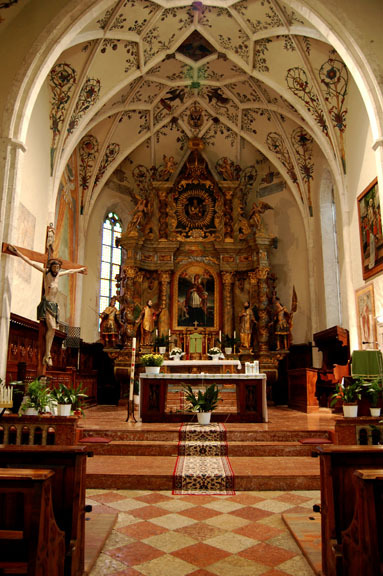 As a child visiting her Tyrolean relatives, Melissa was told she came from a different family than the Genettis who owned businesses in Hazleton (my family). Not expecting to connect with her ancestors, Melissa wrote that she had stumbled upon the Genetti Family Genealogy Project website and emailed me that evening “on a total whim”. As soon as I read the names of Melissa’s great-grandparents (Joseph F. and Mary C. Genetti) and the fact that they had settled in the same area as my direct ancestors, her emailed jumped off the page at me! I had a suspicion that Melissa and her ancestors would lead me to a missing branch of the extended Genetti family tree. But first, an explanation of why I was excited about this inquiry. 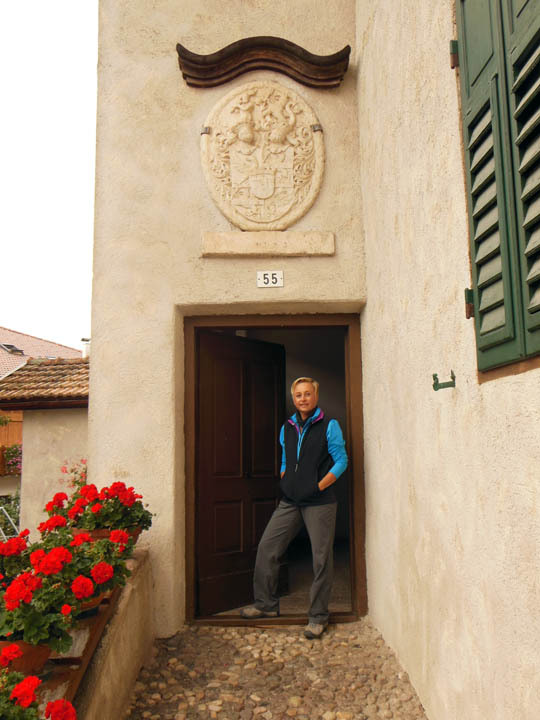 I am 50% Tyrolean (all of my fraternal relatives are from the same pastoral valley in Italy, the Val di Non). All of them emigrated to the same location in Pennsylvania. Therefore, they also are all buried within the Hazleton area in three local cemeteries. Quite extraordinarily, one small country cemetery in Weston, PA is the final resting place for one of my great-great grandmothers (Genetti-Genetti, yes this ancestor was a distant cousin to her husband), one of my great-great grandfathers (Battisti-Marchetti), two great-grandparents (Fellin-Marchetti) and numerous great and grand uncles, aunts and various distant cousins (Bott, Zambotti, Covi, etc). Since I’m related to many of the people buried in this cemetery, I have photographed most of the markers to help with my genealogy research. When Melissa wrote about her great-grandparents, I knew their graves were in the Weston cemetery and that I had a photograph of Joseph and Mary Genetti’s tombstone. But I had never put the pieces together to determine what their relationship was to my family. So I began searching Ancestry.com, FamilySearch.org, as well as my own personal files from Castelfondo for clues to Joseph and Mary’s origins. 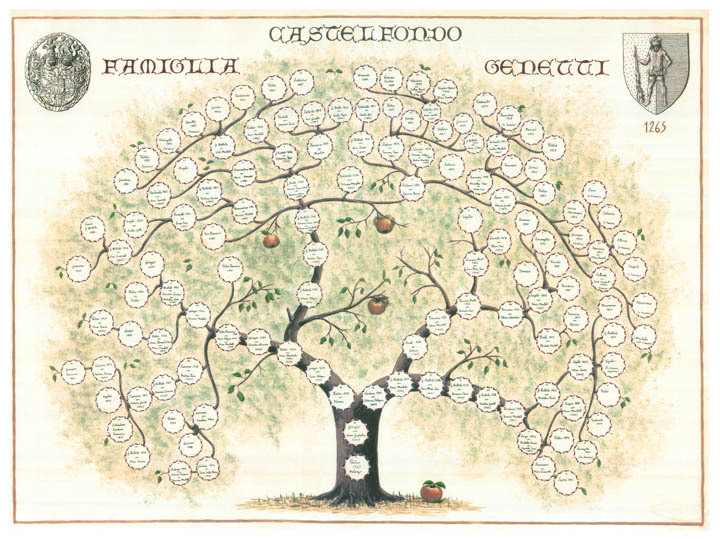 The Genetti Family Tree – Melissa’s 2nd great-grandparents, Giovanni Battista Genetti and Giula Segna, are located at the top, center one row down, right below the “TE” in Castelfondo. 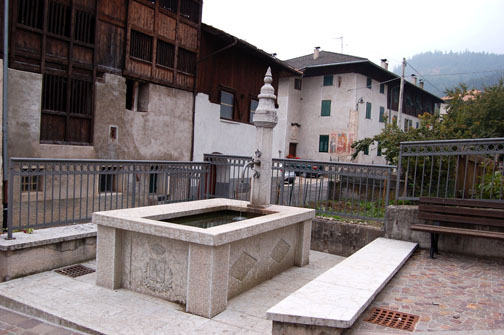 This is what I found: Joseph F. (Melissa’s great-grandfather) was born in 1874 in Castelfondo, Austria (now Italy). He was baptized Francesco Giuseppe Genetti and had obviously Americanized his name when he emigrated to America in 1894. Joseph’s death certificate from 1937 listed his father’s name as Battista Genetti and his mother as Julia Segna. That was the clue I needed! I whipped out my Genetti Family Tree and there they were – both of Joseph’s parents, Giovanni Battista Genetti (born in 1846) and Giula Segna (born in 1853), married in Castelfondo in 1872. They were Melissa’s great-great grandparents. Their line on the tree had stopped with Battista and Giula, but now I knew it continued on in America with their son Joseph. Melissa had provided the missing link! It took only a few moments to trace both branches of the tree (hers and mine) to calculate that Melissa was my 5th cousin once removed! Our closest shared relative was Giovanni Battista Genetti, born in 1767 (my 4th great-grandfather and Melissa’s 5th great-grandfather). Yes we most certainly were related! After this initial discovery, I settled in for a day of research to fill in the blanks (exact names and dates of Melissa’s male Genetti lineage along with their spouses). After a few hours of scanning the Castelfondo records, I found yet another surprise. Melissa’s 3rd great-grandmother, Cristina Battisti Genetti, and my 2nd great-grandmother, Rosalia Battisti Marchetti, were probably sisters! It appeared that they both had the same father, came from the same small village of Caverino, both had married men from Castelfondo and were only four years apart in age. All good signs that they were related. Although there are no records for Caverino before 1865, I thought it was a sound assumption that Cristina and Rosalia were either sisters or 1st cousins. If this were true, Melissa and I may also be 4th cousins once removed through the Battisti family! Unbelievably, I was related to Melissa through both my fraternal grandfather AND my fraternal grandmother! To put it in other terms, my 2nd great-grandmother, Rosalia Battisti Marchetti, was Melissa’s great-grandfather’s grand-aunt. If we return to the same country cemetery in Weston, Pennsylvania where Joseph and Mary* are buried, we find a few rows away a headstone for Lorenzo Marchetti (my 2nd great-grandfather). On the headstone is a memorial to Lorenzo’s wife, Rosalia. She had died in Castelfondo at the young age of 42, just one year after delivering their eleventh child (who died in infancy). 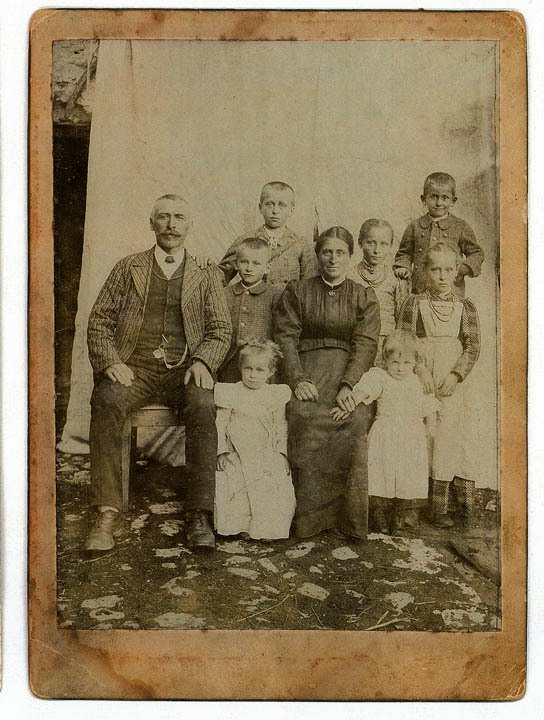 Several years after Rosalia’s death, Lorenzo emigrated to Pennsylvania with their six surviving children. Melissa’s great-grandfather, Joseph, never knew his grand-aunt Rosalia, since she died fours years before he was born. But now the memories of Rosalia and Joseph were tied together by the odd coincidence of their stone memorials being in the same unassuming cemetery in a new country. And, of course, by the inquisitive nature of their great-granddaughters! My research of Melissa’s relatives has been added to the online Genetti family tree, resulting in twelve new ancestors and an extension of her branch into modern times. Many thanks to Melissa H. for acting “on a total whim” and contacting me. I feel it is always an honor when I add ancestors to our family genealogy. And a wonderful surprise when I connect with a new cousin! To purchase a print of the original Genetti Family Tree, click here! * Mary’s baptismal name was Maria Concetta Bertoldi. I just got word that Redbubble (the company I have chosen to produce fine art prints of the Genetti Family Tree) is having a sale! Starting today through Thursday, November 6th, Redbubble is giving 15% off of all prints! You heard right. If you have been considering purchasing a print of our beautiful family tree for yourself or as a gift – NOW IS THE TIME! To receive your 15% discount, you must use the promo code: RBHOLIDAY15 when checking out at Redbubble’s online store. Don’t wait – this offer expires Thursday night!